Former Coventry Socialist councillor Dave Nellist had this letter published in the Coventry Telegraph this week congratulating Charterhouse residents on securing the future of The Charterhouse and Charterhouse Park. Dave represented St Michaels ward, which includes Charterhouse, on Coventry Council and was heavily involved in the residents campaign to keep the area a public space. “The announcement of multi-million pound funding for The Charterhouse and Charterhouse Park is a wonderful success for the preservation trust, and all credit must go to them. But equally so major recognition must be given to the years and years of work of local residents to preserve the area as a public park, which made everything possible. 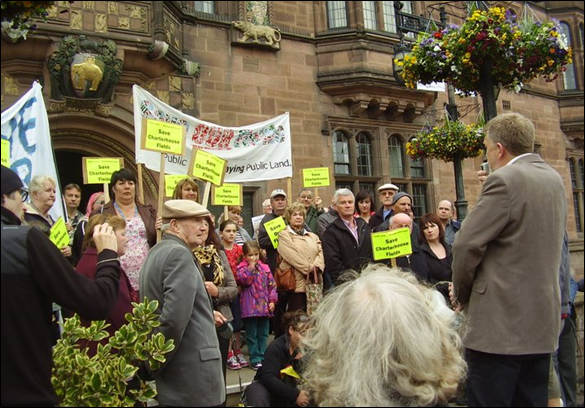 Without over 40 years of campaigning to preserve public access to the land, we would not be in the position today to see the development of one of Coventry’s major historical sites married to an extension of public space for all communities to enjoy. In particular the many hundreds of local residents whose active involvement in the Village Green application in 2011 both highlighted continual community use, drew attention to the historic nature of the land, and prevented pre-emptive plans to block access. Without them we wouldn’t be here now on the cusp of a great new park for Coventry. Without the work of the local residents’ association kicking up a fuss when the former owner of the Charterhouse building put it up for sale this special piece of history could have been lost. To those who tell local communities that protest, campaigns and active involvement in their areas are pointless and can never win, we can now point to The Charterhouse as living proof that when local residents get organised, things can really happen.